In the school, we have been taught that the building block of all matter is particles. In fact, we often continue to teach this at universities level where we explain that quarks and leptons form the lego-bricks from which all matter is made. According to the Quantum field theory, The building blocks of matter or this real universe is not the particles at all, instead of this they are the continuous fliud-like substances, which is spread through the all of space. Physics is wonderful way for people to understand the world around them. It can explain how birds fly, why ice freezes, what makes fire glow, just to mention few things. Now this doesn't mean that the explanations are always easy and clear. In fact, the explanations can be downright murky for phenomena far from the familiar. Perhaps the two physics theories that are the hardest to accept when you first encounter them are Einstein's theory of relativity and quantum mechanics. The first one talks about how moving clocks run more slowly than stationary and how objects in motion appear to shrink. The second one tells than no measurement is certain and that probability reigns to supreme in the subatomic world. There is some credible debate about these theories and that some scientists have somehow figured out a way to return to the more intuitive physics of late 1800's, but that isn't true. The simple fact is that relativity and quantum mechanics have been tested countless times and they work. Like or not, we have to learn these weird predictions are just, simply, well, true. However- and this might blow your mind- these ideas are also about a hundred years old. Frontier science has actually moved on. What scientist currently thinks is eve weirder still. So, let's review a bit what traditional quantum mechanics is all about. It was invented in the mid 1920s and it was exemplified by an equation devised by Erwin Schrodinger, what we call now Schrodinger's equation. This equation explained why electrons had only certain energies and positions when they circled an atom. At its very simplest, the equation explained that an electron could be here or there, but never here nor there. That's what "Quantum" means. There are certain, discrete things that are possible and others that aren't. The things that were quantized could be mass, charge, position or energy. Now, Schrodinger's equation was only a partial Quantum theory and it didn't take into account relativity. What it did was taking a proton and assume it was surrounded by a classical electrical field. Remember that classical fields are not quantized. They vary smoothly. However, things changed in mid 1920s when Paul Dirac started puttering around with quantum mechanics. One thing he did was successfully merge quantum mechanics and Einstein's theory of relativity. Another thing he spearheaded was to figure out a way to make a fully quantum theory. He did this by finding a quantum formulation of the electric field surrounding the proton. We call this the "second quantized revolution." This just means that the electric field was expressed quantum mechanically and that it joined such things as a quantum description of the location of the matter, which was covered by the first quantum revolution. In the ensuing years, these ideas have been generalized to cover all of the subatomic forces specifically the strong nuclear force, the weak nuclear force and electromagnetism. While each force has a different precise formulation, they are all examples of what we now call a Quantum Field Theory or QFT. Although each theory has its own interesting peculiarities, I want to tell about a little about some general truths of all quantum fields. 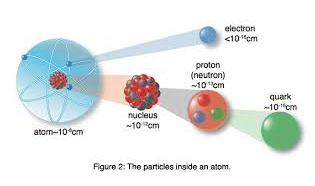 In modern physics theory, one can picture all subatomic particle as beginning with a field. Then the particles we see are just localized vibrations in the field. So, according to quantum field theory, the right way to think of the subatomic world is that everywhere- and I mean everywhere- that are a myriad of fields. Up quark fields, down quarks fields, electron fields, etc. And the particles are just localized vibrations of the moving fields that are around. The idea can also explain how particles interact. For example, suppose you have an electron moving along. The electron is a localized vibration of electron. 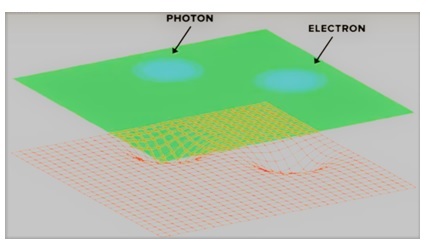 If the electron emits a photon, then the field theory way to looking at things and says that some of the energy of the electron field set up a localized vibration of a photon filed which then moves away. So, those are essential features of quantum field theory. Theoretical physics simply imagines that ordinary space if full of fields for all known subatomic particles and that localized vibrations can be found everywhere. These can interact with one another, like adjacent tuning forks (Figure1.). These interactions explain how particles are created and destroyed in physical world- basically the energy of some vibrations move from one field and set up the vibrations in another kind of field (Figure 2.). Now, of course, calculating something with this prescription is very difficult. The math can be crazy. But the basic idea is very simple. If you look around you and have even the smallest ability to think creatively, you can imagine these vibrations everywhere you look. I don't know about you, but I think that's awfully cool idea. This process gives us the understanding of particles. This equation tells us that Energy is conserved. For instance, emitting a particle from a substance can change the number of particles in a state. Since Quantum mechanics and theory of relativity are the two corners of physics their combination can create a lot of new framework for physics. However, QFT is important while you're dealing with a quantum theory of fields (it doesn't matter whether it is relativistic or not). Quantum fields occurs frequently in condensed matter physics and a lot of the biggest ideas in quantum field theory originate from condensed matter physics.In condensed matter physicsFeynman diagrams are commonly used to describe the properties condensed matter. Quantum field theory methods are also used to study 1 Dimensional fermions. QFT has also been applied to statistical mechanics, e.g. While we study quantum phase transitions and critical phenomena where renormalization group methods are commonly applied to obtain critical exponents. We offer Quantum Field Theory assignment help, Quantum Field Theory assignment writing help, assessments writing service, Quantum Field Theory tutors support, step by step solutions to Quantum Field Theory problems, Quantum Field Theory answers, Physics assignment experts help online. Our Physics assignment help service is most popular and browsed all over the world for each grade level.